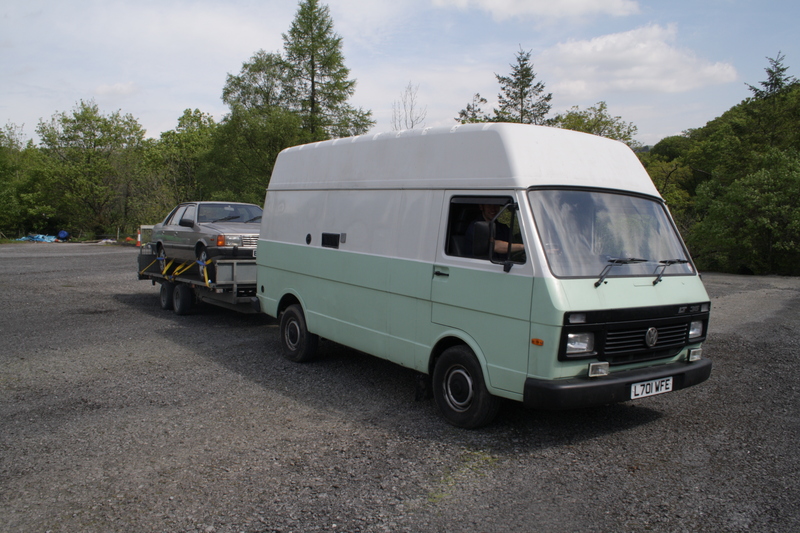 Craptacular Road Test: Volkswagen LT – HubNut – celebrating the average! I remember clambering into a Volkswagen LT at the NEC Motor Show, probably in 1990 when I was 12. I can’t really explain why, but this was always the Volkswagen van of choice for me. For a start, it didn’t have an engine in the load bay. This seemed sensible. It’s also enormous and even as a child, I felt like I was sitting in more of a truck than a van. I was also already horribly addicted to the six-cylinder growl these vans usually emitted. My hearing was tuned to listen out for the smooth bark of an LT on the move. I guess it says something about me when an LT interested me much more than any other Volkswagen on the stand that year, including the Corrado with its clever lifting rear spoiler. Welcome to my world. Somehow, it took until 2014 for me to get the opportunity to drive one, thanks to my mate Mat. He heroically used the van to tow a Hyundai Stellar V8 (a car I really would like to road test one day, when it’s back on the road, hint, hint) all the way from Anglesey to my village. How convenient! For the purposes of the test, the Hyundai and car trailer were removed and are pictured purely for artistic licence. Clambering aboard is a challenge, as it really is like climbing into a lorry cab. You sit high up, with a huge steering wheel in front of you and your knees perilously close to the very front of the vehicle. A burst of glow plugs and the six-pot engine fires into life. This is largely similar to the engine used in the Volvo 700/900 turbo diesels (and the 240 on other shores). This one was turbocharged, kicking out 127bhp@4700rpm and a meaty 203lb ft of torque at 2550rpm [EDIT sorry, only 95bhp and 150lb/ft – which explains a lot!]. The five-speed gearbox has a dog-leg first. It’s a very short gear that you don’t generally need on the flat. I pottered around the car park in second and got a feel for the vehicle. It felt enormous! This is seriously wide and it feels far more so than the later, Sprinter-based LT. Edging out of the car park, I aimed it up a hill. This was a mistake. Was the throttle broken? Had I left the handbrake on? Had a joking friend reconnected the car trailer and Hyundai while I wasn’t looking? No, it really was this slow! The turbocharger takes an absolute age to wake up. It’s laggier than a water pipe in Iceland. Mind you, it does make a superb noise as it spools up. Then there’s a brief burst of excitement as the engine growls more menacingly and speed builds up. Problem is, you have to wave a lengthy gear lever around to try and get the next gear before the turbocharger slows down too much. This is challenging work! Catch it off boost and performance just disappears entirely. My friend’s heroic towing efforts from North Wales became all the more impressive. Apparently, he was reduced to first gear at one point. Thankfully, the steering is rather pleasant, so you can focus on extracting the best from the engine. This LT is camper converted, and they were never particularly light to start with. What amazes me most is that you could specify one without the turbocharger! With less than 80bhp, how do they even move? Hills aside, you can amble along quite nicely. It feels composed and almost relaxing. The high-and-mighty driving position is very comfortable. On flatter terrain, the turbocharger woes are less extreme. It does sound magnificent too. Multi-cylinder diesels are ace! Overall, I’d certainly far rather drive one of these to Scandinavia than the Citroen H van we actually used back in 2007. Yes, it is still slow, but the engine sounds nice without being too loud, and it seems comfortable and refined at 50mph rather than screaming flat out. It’s a shame most have rusted away. I still maintain that the LT is a far better van than the rear-engined types. This was definitely a test I enjoyed. Worth waiting for!